The only table of the four listed that I utilize is aspnet_Membership, and the only other table I use is aspnet_Users from implementing forms authentication. What is TextInRowSize and why does SQL Azure care about it? Do I have any option to modify aspnet_Membership to make it compatible? If it would be easier to remove the current system altogether and replace it with my own, I'm fine with that too. First, open SQL Server, right click the database you want to transfer and click "Tasks > Generate Scripts..."
Next, click "Advanced" on the scripting options panel and find the row "Script for the database engine type." 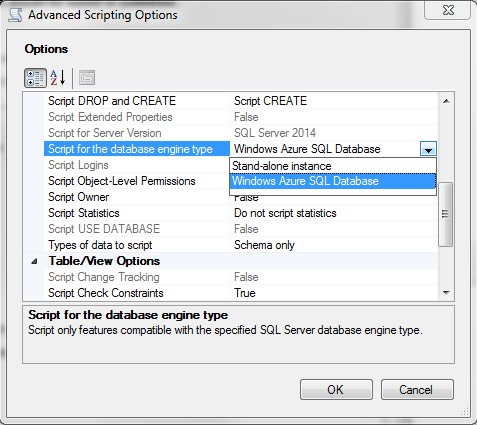 Select "Windows Azure SQL Database" and click OK (Note: if you have data that you want to transfer as well, choose "Schema and Data" from the "Types of data to script" option). Proceed thru the rest of the script generation dialog, remembering where you saved the script file. Connect to your database server using SQL Server or windowsazure.com. 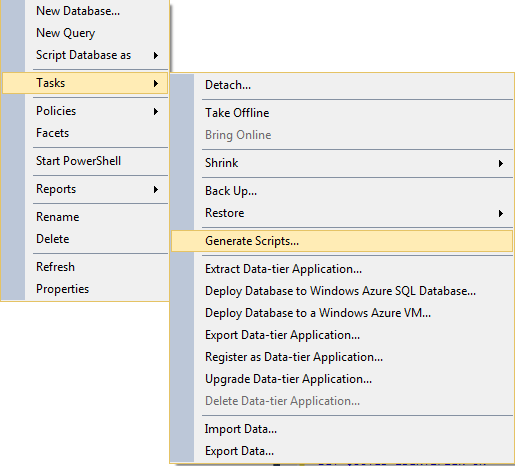 Generate a new query for your new database, enter the script that was generated by SQL Server and execute.